The 208-page hardcover tome will provide artwork and fun facts for over 200 major Capcom characters. Break out the birthday candles, Capcom is turning 30. The legendary Japanese developer/publisher is behind such iconic franchises as Mega Man, Resident Evil, and Street Fighter. Each of these franchises is host to a myriad of unique characters, and to celebrate, strategy guide maker BradyGames is publishing the official Capcom 30th Anniversary Character Encyclopedia. The encyclopedia will be a whopping 208 pages long, and feature a nice shiny hardcover - just like a real book! It will provide artwork and fun facts for over 200 major Capcom characters, from Ghosts and Goblins's Arthur to Street Fighter's Vega. 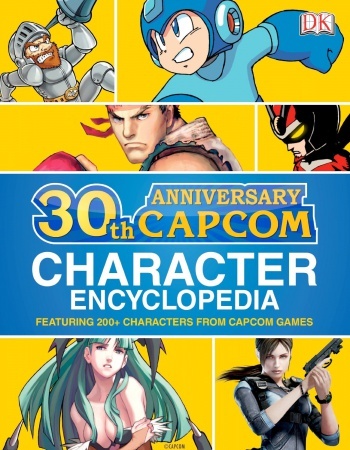 "Full of facts, statistics, and historical information, the Capcom 30th Anniversary Character Encyclopedia will offer any fan of Capcom's illustrious library of video games insight and background for all of their favorite characters and video game series," claims an ad for the book on Amazon, where you can pre-purchase the guide for an RRP of $16.99. The book won't be out until October 21, but for any fans of Capcom's work it's a must-have. Capcom haven't been making the best of decisions lately, but their influence on the gaming industry is something that no-one can deny. All it takes is the opening few bars of the Mega Man boss select theme to get me thinking back to the good ol' days. Lately, Capcom have been trying to ride the nostalgia train by announcing a DuckTales reboot for next-gen consoles. Probably a good move for them, considering the disappointing reviews that its new games like Resident Evil 6 received. The reboot was recently officially confirmed for a PC release.